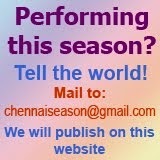 A special thematic concerts are hosted by Madhuradhwani on Dec. 21 and 22 at Arkay Convention Centre, RH Road, Mylapore. 9.30 am - 11.00 am : Lalitha Ravi - dance music forms. 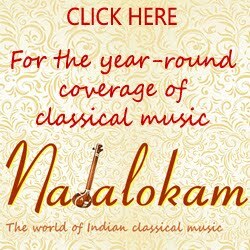 H V Raghuram - Violin, Surya Subramaniam - Mridangam"
7.00 pm - 9.00 pm : Suguna Varadachari - Tribute to Saint Tyagaraja by other composers.